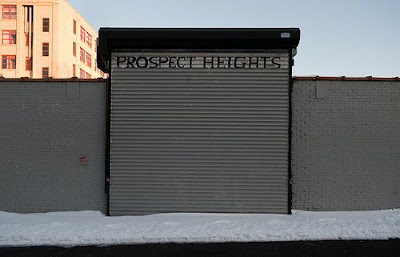 For years there were murals on the east side of Carlton Avenue between Dean Street and Pacific Street, painted by Patti Hagan and Schellie Hagan of the Prospect Heights Action Coalition (PHAC), on property owned by Henry Weinstein, who has resisted selling his building and adjacent lots to Forest City Ratner. Hagan also thinks the removal was tied to the October visit to New York by prospective Nets owner Mikhail Prokhorov. She thinks Prokhorov would have come to Brooklyn. However, given that there were no media reports of such a visit, I think it's more likely some of his associates visited the AY footprint. Below is a lightly edited email from Hagan. One day in the first week of October 2009, two neighbors, who'd been walking around the 'hood, phoned to ask why the PHAC Wall Murals ["NO EMINENT DOMAIN ABUSE,""ATLANTIC YARDS 'R' BELLY UP," "GEHRY THY NAME IS EMINENT DOMAIN," "SU CASA ES BRUCE CASA," "WE'RE TAKIN' 'EM ALL -- BRUCE 'N FRANK," plus the masked-rat stencils wielding wirecutters] that my sister, Schellie, and I had painted on Henry Weinstein's Carlton Avenue walls beginning 5 1/2 years ago -- had been painted out, greyed-out...except for the big OBAMA mural at the corner of Dean. I've been sleuthing out this Who Dun It? for almost 3 months now -- and, by a process of elimination, I am left with my original suspect: Bruce Ratner. It had taken me & Schellie, at different times since 2004 -- about 2 weeks, solid, to paint the Weinstein Wall Murals. (We had re-painted several sections, over earlier anti-Ratnerisms that had read: "RATNER: HANDS OFF OUR HOMES!" and "GEHRY FLUNKS M.I.T.") Nobody had messed with them, ever, in 5 1/2 years. I tried to find out which government agency might have acted on a Ratner "ask" and executed a signed "Graffiti Free NYC Waiver for Free Graffiti Removal." (The "consent to enter & release of liability" form begins: "Step 1: Read & Sign. As the Property Owner ... I grant consent...") On November 9, I went to Borough Hall and met with Tonya M. Hill (Deputy Director of Community Service Center), who is in charge of Borough President Marty Markowitz's two-truck Graffiti Removal squad. She could find no Owner Waiver for Free Graffiti Removal. She suggested that the Mayor's Graffiti Removal people might have done the job, or the NYPD's 77th Precinct -- and offered to check with those offices. On November 9 Henry Weinstein e-mailed me. "I have not authorized anyone to remove The Community Messages that Schellie and you worked so hard to create. This was so much more than a community message. 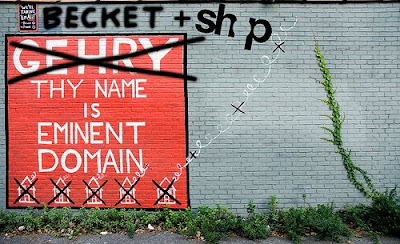 The No Eminent Domain Abuse slogan painted on the roll down gate has been published and distributed in newspapers, magazines and TV both in the United States and Internationally. It is a violation of Our Constitutional Rights to Free Speech. It is so offensive that it has been obliterated, for the sake of some Russian Oligarch and his cronies not being offended. It is a disgrace." On November 16 I wrote Ms. Hill to thank her [and point out that] Mr. Weinstein's authorization for these Murals has been on file with the NYPD 77th Precinct for 5 1/2 years. What was done to Mr. Weinstein's Mural Wall was not "Graffiti Removal" -- it was unauthorized "Community Message Removal." Vandalism. On December 2 Tonya Hill e-mailed me: "I heard back from my contact person at the Mayor's Office (Jamarah Harris). She indicated that she has reached out to the Precinct and they also were not responsible for removing the graffiti. Again, she reiterated that the city did not have any waivers to remove the graffiti nor did my office. Unfortunately, there is nothing else we can do because we checked with all parties who could have removed it." By coincidence, at a party two days later, I met Harris (Director of Policy & Initiatives, Community Affairs Unit, Office of the Mayor). She told me that after finding nothing in her files, she sent two people out to the site to double check. The Mayor's Graffiti Removers had never been near the Carlton Avenue Wall. After eliminating Ratner-operating-through-Marty, Ratner-operating-through-Bloomberg, Ratner-operating-through-NYPD: all clues point to Ratner [FCR] himself. I suspect that Ratner dispatched the nondescript white guy in chinos from MetroTech, to paint out our Ratlantic Yards-hostile Community Message Murals so that his Russian Oligarch, Prokhorov, on his mid-October site visit, would not find evidence that the Prospect Heights natives are not friendly. PS. Immediately after we had painted the Wall Murals -- Henry Weinstein was visited by two emissaries from Forest City Ratner. They were intent on painting-out our murals. The men said "They make Mr. Ratner uncomfortable. We want to paint them over." Henry said "No! Over my dead body!" That being the case, I would imagine Ratner has been irritated by the murals and itching to wipe them out the past 5 1/2 years. Since all project opponents are painted with a broad brush (pun intended) then clearly whoever did this was Forest City Ratner. And whoever did it was trespassing. As usual Forest City Ratner has no respect whatsoever for private property, unless, of course it is their's. So, when do we paint over it? And do you need any help?